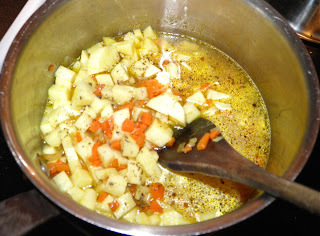 Warm and filling – fish chowder. It's kind of a weird this morning. Daylight Savings Time started in Canada last night so it feels a whole hour earlier than it actually is as I write today's post. But it's also warm enough (although dark) to go outside without a coat. Has spring "sprung"? Yesterday saw a LOT of work done at the little country house. I thought our basement would be a disaster site for months. It is now about as clean as I've seen it for a very long time. We still have piles of plastic bins, but they are now orderly. Thanks to my wonderful, hard-working spouse. He did a lot of work yesterday. And burned a lot of garbage too. Did I say he did a lot of work? So what's more deserving after a hard day's labour than something filling? It may not seem possible, but here's a fish chowder that's "stick to you ribs." This chowder is actually like a thick bisque wit large chunks of delicious, just-cooked fish. 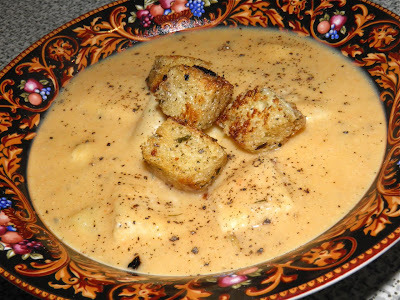 I actually looked up the definitions of chowder and bisque because I wasn't sure what to call this. Add enough water to cover the vegetables about 1/2"
over their top. This level is for the photo only. It's kind of 50/50. It's also very thick. The thickness comes from a substantial amount of vegetables: onions, carrots and potatoes. After cooking, they are puréed in the cooking water and then thinned to your liking with milk. Thicker yields fewer, but more substantial servings, of course. It's up to you. All in all a very hearty meal. I used Basa fish. Basa is a species of catfish native to the Mekong Delta in Vietnam. It is white with a mild taste I would compare to sole, but it is more substantial and won't break apart as easily. It recently has made a major jump into international markets. It was on inexpensive, so that's how it ended up in my chowder. I would still prefer nice chinks of fat haddock. But for a difference – and cost savings – it made a pretty tasty dinner. I don't think I would seek it out, though. You'll notice the recipe calls for grape seed oil. I've been using it instead of vegetable oil because it has a relatively high smoke point (421°F/216°C) and high polyunsaturated fat content. Try it in your next salad dressing. It's not very expensive either if you buy the Atlantic Superstore/President's Choice brand. Since I had some homemade bread lurking around I quickly made croutons in a cast iron skillet with some garlic, butter and tarragon. Tarragon always goes well with fish dishes and the croutons added some texture that complemented the creamy soup perfectly. 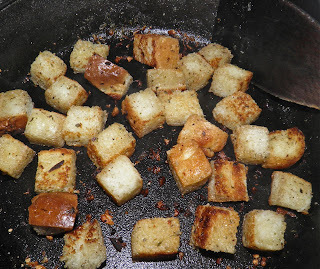 If you can cut bread you can make croutons. Heat the grape seed oil in a stock pot. Add the carrots and onion and sauté until they start to soften and the onions colour slightly. Add the potatoes, 1 tsp of salt, cover with water to slightly above their top and simmer for 15 minutes until very tender. Add more water if necessary while they cook.. Remove the pot from the heat. Add the lower amount of milk and purée with a stick blender until smooth. Add the remaining milk, or more, if the purée is too thick. Taste for salt and adjust. Stir in the tarragon, paprika, butter and a good amount of pepper. Add the fish and gently bring the soup back to a simmer. Stir gently so the fish doesn't break up. Melt the butter in a skillet. Add the garlic and sauté until fragrant. Then add the bread. Crush the tarragon with your fingers. Sprinkle the bread with the tarragon, salt and pepper. Let the cubes cook until browned.